Primary cardiac lymphomas are very rare, representing only 0.5% (1) of all lymphomas and 1.3-2% of all heart tumors (2). Cardiac involvement from systemic lymphomas is more common, comprising 8.7-28% of all lymphomas (1). These secondary cardiac lymphomas are non-Hodgkin lymphomas. Most frequently, they affect the pericardium, and then the myocardium. Pericardial tamponade is by far the most frequent manifestation; however the patient presentation is a based on the area of cardiac involvement (3, 4). Lymphoma is a group of cancers that affect the cells that play a role in the immune system, and primarily represents cells involved in the lymphatic system of the body. The presence of lymphoma within the heart has both local and systemic effects. In this report, the authors describe a patient who presented with evidence of right-sided heart failure secondary to cardiac involvement of systemic lymphoma. An 81-year-old man with a history significant for hypertension began to experience worsening shortness of breath, fatigue, and lower extremity edema. He was found to have a left upper lobe mass, but a biopsy was non-diagnostic. 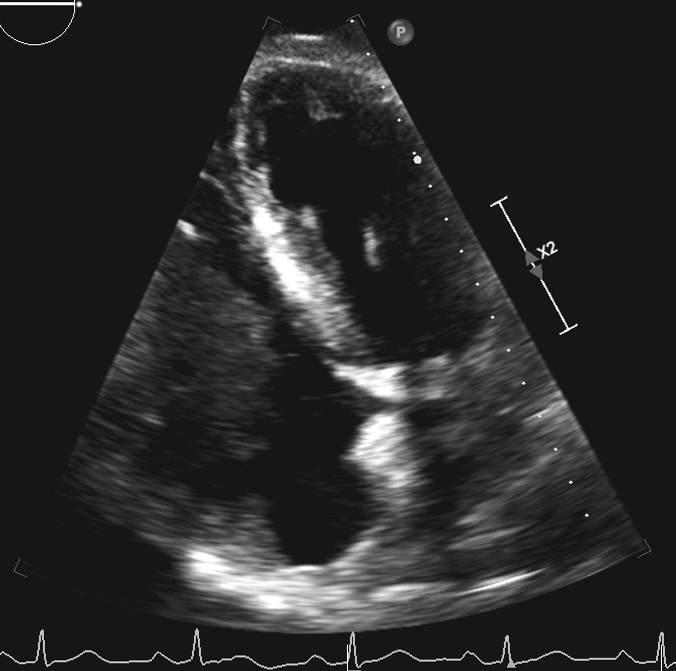 On further workup, a transthoracic echocardiogram (TTE) showed a large mass within the right atrium, which extended into the right ventricle (Figure 1). The patient had undergone a PET (positron emission tomography) scan, which showed +FDG (fludeoxyglucose) activity within the left upper lobe and mediastinum lymph nodes. The patient underwent a mediastinoscopy and bronchoscopy for tissue but both samples were non-diagnostic. The patient began to show signs of worsening right heart function with increased bilateral edema, elevated jugular venous distention, and complaints of worsening shortness of breath. Cardiac surgery was then consulted for tissue diagnosis and excision of the right atrial mass. In the operating room, the patient underwent general endotracheal anesthesia. After his sternum had been divided, his right atrium and ventricle appeared distended, and there was evidence of moderate right ventricle dysfunction. On palpation of the right atrium and ventricle, the mass could be easily felt. After Heparin administration, the aorta was cannulated and there was bicaval venous cannulation. The heart was arrested and a right atriotomy was performed. The mass was stuck to the right atrium (Figure 2A and Figure 2B), tricuspid valve, and right ventricle. There was also invasion into the myocardium of the right ventricle. There was no possibility of excision of the mass in its entirety, but multiple biopsies were sent for evaluation (Figure 3). 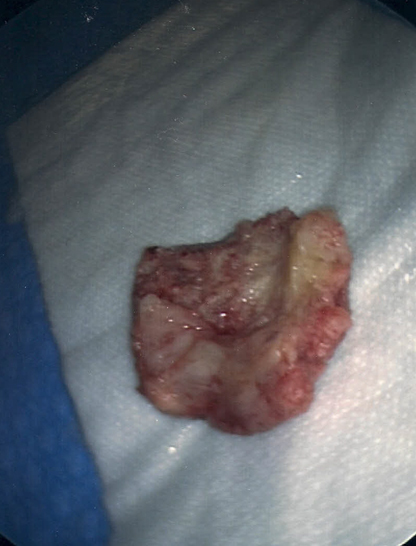 The frozen section returned as lymphoma. The atriotomy was closed, and the patient was weaned off cardiopulmonary bypass. The sternum was then closed, and the patient was sent to the surgical intensive care unit. The pathology showed monoclonal B cell lymphoma. After the patient recovered from his surgery, he was started on chemotherapy treatment while still in the hospital. His symptoms of shortness of breath and lower extremity edema improved prior to his discharge home. The patient was later seen in clinic, and the majority of his symptoms had improved. A follow-up TTE showed that the mass had significantly reduced in size. In this case, the patient presented with signs and symptoms of right heart failure secondary to an intracavitary mass that was lymphoma. The patient underwent an incisional biopsy and debulking of the mass, since it was not able to be excised in its entirety. The final diagnosis was a diffuse large B cell lymphoma. The patient was treated with surgery and chemotherapy, and his symptoms improved. The patient was later discharged home, and followed-up in clinic after two weeks. A repeat TTE showed almost complete disappearance of the mass and improved right ventricular function. In addition, the edema in his lower extremities resolved, and he no longer had previously experienced symptoms. The majority of the literature details patients with the rarer primary cardiac lymphoma. Some patients are even described to have masses within the left atrium that caused complications (5). 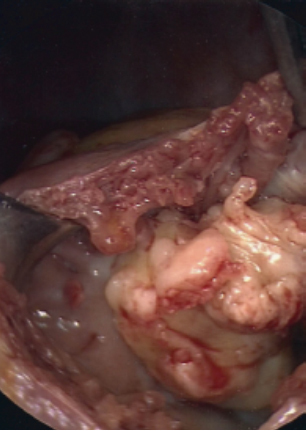 Sharma et al reviewed a patient with a left atrial lymphoma that resulted in severe mitral valve regurgitation requiring surgical intervention. This discussion is focused on the more commonly found secondary lymphoma causing right-sided heart failure. Malignant lymphoma has cardiac involvement in 20-25% of patients (6, 7). This is usually in the context of widespread disease. The pattern of cardiac involvement varies from nodular intracavitary growths causing outflow tract obstruction, to a more infiltrative spread, usually in the right but also in the left side of the heart (8). The involvement of the right atrium and ventricle resulted in moderate right heart dysfunction, which is often very difficult to manage. Fortunately, the combination of debulking of the tumor and chemotherapy proved to be an effective treatment for this patient. Finally, this patient demonstrates a rare presentation of intracavitary lymphoma and the complex management of right heart failure. Chim CS, Chan AC, Kwong YL, Liang R. Primary cardiac lymphoma. American journal of hematology. 1997 Jan;54(1):79-83. PubMed PMID: 8980266. 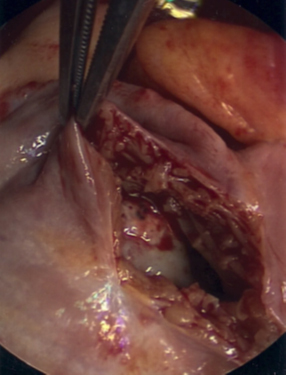 Steger CM, Hager T, Ruttmann E. Primary cardiac tumours: a single-center 41-year experience. ISRN cardiology. 2012;2012:906109. PubMed PMID: 22792486. Pubmed Central PMCID: 3391967. Bolis S, Bregani ER, Rossini F, Schiavina R, Pogliani EM. Atrial flutter followed by sick sinus syndrome as presenting symptoms of B-cell malignant non-Hodgkin lymphoma involving the heart. Haematologica. 1993 Sep-Oct;78(5):332-4. PubMed PMID: 8314164. Fuzellier JF, Saade YA, Torossian PF, Baehrel B. [Primary cardiac lymphoma: diagnosis and treatment. Report of 6 cases and review of the literature]. Archives des maladies du coeur et des vaisseaux. 2005 Sep;98(9):875-80. PubMed PMID: 16231573. L ymphome cardiaque primitif: demarche diagnostique et therapeutique. A propos de 6 cas et revue de la litterature. Sharma A, Minhas HS, Sakhuja P, Satsangi DK. Left atrial primary B cell lymphoma presenting with mitral regurgitation. Journal of cardiac surgery. 2012 May;27(3):300-3. PubMed PMID: 22385558. Roberts WC, Glancy DL, DeVita VT, Jr. Heart in malignant lymphoma (Hodgkin's disease, lymphosarcoma, reticulum cell sarcoma and mycosis fungoides). A study of 196 autopsy cases. The American journal of cardiology. 1968 Jul;22(1):85-107. PubMed PMID: 4873149. McDonnell PJ, Mann RB, Bulkley BH. Involvement of the heart by malignant lymphoma: a clinicopathologic study. Cancer. 1982 Mar 1;49(5):944-51. PubMed PMID: 7037154. Constantino A, West TE, Gupta M, Loghmanee F. Primary cardiac lymphoma in a patient with acquired immune deficiency syndrome. Cancer. 1987 Dec 1;60(11):2801-5. PubMed PMID: 3677014.